These bags are filled with a variety of soy tealights, some old, some new, some are discontinued scents. They have a medium fragrance load. The tealights come in clear polycarbonate recycleable cups, unless the listing says metal cups, and are packaged in a natural plant-based cellophane bag with label. EO = Scented with Essential Oils. These have an additional fee. Colors are listed at the end of the scent name. Colored tealights have color fading. This is a natural occurance in soy wax candles and does not affect the burn quality of the candle. 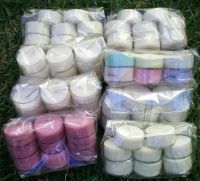 We do not use vybar or color stabilizers in our candles. Each candle burns for approximately 5 hours.